Srinagar, February 11: In yet another glaring example of “insensitivity” a specially-abled person was allegedly denied treatment by the doctors at Shri Maharaja Hari Singh (SMHS) hospital here today. 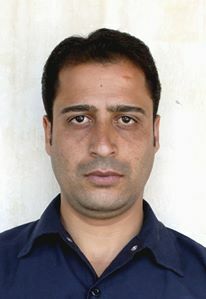 A family from Beerwah area of central Budgam while narrating their ordeal during a protest at Press Enclave said that Mohammad Lateef 25 who was diagnosed with some stomach disorder was refused treatment by the doctors at SMHS hospital. “We can’t touch him as he is dirty, it would be better if you shift him to some other hospital for treatment,” alleged patient’s sister. The protesting Beerwah family alleged that the doctors not only denied treatment to their specially-abled brother but also manhandled females who had accompanied him to the hospital. “After getting the admission card we were asked to visit emergency ward for treatment of my brother who is mentally retarded. He can’t move nor can he talk properly. We often take him to SMHS hospital for stomach treatment but the doctors this time crossed all the limits of inhumanity,” she added. The family staged demonstrations to highlight inhuman treatment meted out to the patient. “We had already arranged all medicines from the open market, however the behavior of doctors made us to believe that there is no place for poor people in this world. We cannot expect justice from the system which itself is handicapped but still appeal the administration to take note of the issue so as no other patient is denied treatment at SMHS hospital in future,” said the family. Principal Government Medical College (GMC), Professor Samia Rashid while talking to ‘Kashmir Images’ denied allegations saying people unnecessarily stage dharnas and protests which carries no weight. “I called the CMO and got that patient admitted. I don’t know why people highlight issues which are not in the right perspective. There is no signature of any doctor on the prescription, how could a doctor prescribe IMV fluids. Now the patient has been admitted and I asked the concerned RMO to provide everything the patient needs,” she added.